FILE - A Zimbabwe National Parks official inspects the country's ivory stockpile at parks headquarters in Harare, June 2, 2016. 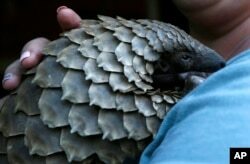 Ugandan authorities on Jan. 31, 2019, announced the confiscation of about 750 pieces of ivory plus pangolin scales brought in from South Sudan. FILE - A pangolin from the Johannesburg Wildlife Veterinary Hospital is taken to a nearby field to forage for food near Johannesburg, March 16, 2018. Their scales — made of keratin, the same material as in human fingernails — are in high demand for Chinese traditional medicine, to allegedly cure several ailments, although there is no scientific backing for these beliefs.